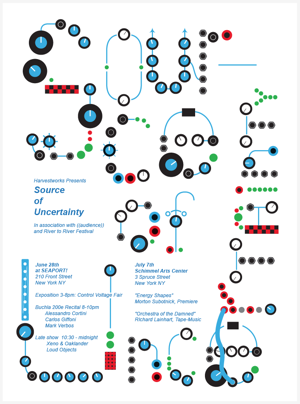 [Jun 2] Support our Source Of Uncertainty – IndieGoGo Campaign! 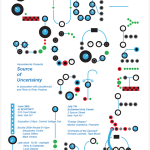 Source of Uncertainty celebrates the Buchla 200e and DIY modular synthesis. Centering around two free New York City concerts, on June 28th and July 7th, the series is a collaborative initiative of New York-based curatorial organizations, Harvestworks and ((audience)), and takes place as part of the River to River festival. The first event will feature a modular synth fair and we will be interviewing Buchla musicians for a program on Art on Air. 1) Artist compensation goes to Morton Subotnick, Alessandro Cortini, Carlos Giffoni, Mark Verbos, Xeno & Oaklander, and Loud Objects. Participating artists are transporting their large synthesizer system, in Alessandro’s case flying out to the event, and preparing works specific to the event. 2) Event production costs include the speaker rental, lights, transportation of the large 200e cabinets, table and chair rental, lunch for interns. We are rigging a nontraditional event space and need additional filler speakers for quadrophonic (multichannel) experience. Equally important, we have to buy some wine and beer for June 28th!